Wowzers!! Fresh Fruits and Vegetables have the whole month of June to call their own! 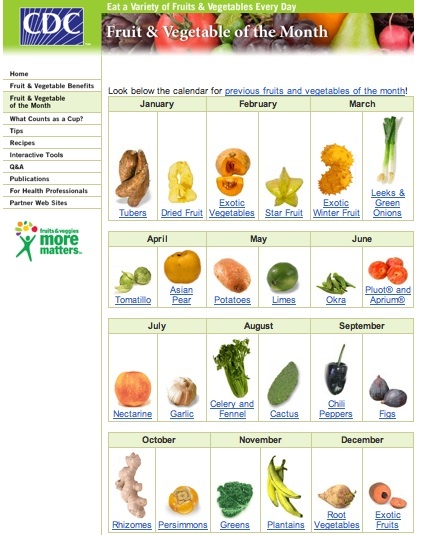 And did you know that the CDC has designated fruits and vegetables for each month too? Okra and Pluots© and Apriums© are our June Vegetable and Fruits! I think I'm going to have to do some research on Pluots© and Apriums© though!! What are they? As a quilter and sewer, I am fascinated with the wide variety of fabric designs available today that incorporate fruits and vegetables! And while they are not as nutritious as the real thing by any means, they certainly do whet the appetite at times! I make both potholders and reusable snack sacks from fabric with fruit and vegetable designs. Here are some of my hand-chenilled potholders - bananas, apples, and pears. The backs of these potholders have several layers of flannel that I then chenille by hand. These potholders are so very soft and also form and flex in your hand so you can get a good grip on that hot pot or pan you're trying to maneuver. Take a look at the green apple photo above. And here's the back of the pear potholders. In my stash, waiting to be made, are oranges, raspberries, watermelon, more apples, eggplant, peppers - yes, I do have an entire vegetable garden and a vast orchard in my sewing room! And what have you created that features fruits or vegetables? Please share your handmade creations below - just add right after my Today's Abundance list. Include the link to your blog post or your item that is handmade and features either a fruit or a vegetable!